A trial attorney and shareholder at the firm, Josh focuses his practice on civil litigation, including medical malpractice defense, business litigation and family law. Josh also practices extensively in administrative cases, specifically professional licensing defense. 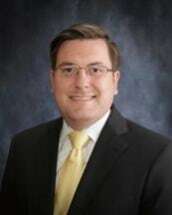 He has successfully litigated cases at the trial and appellate court levels in both state and federal court and extensively in various administrative bodies. Josh works closely with each of his clients to achieve positive outcomes and favorable solutions to their problems. Josh received recognition in 2013 by Missouri Lawyers Weekly for one of the top defense verdicts in the state of Missouri. Josh was also recognized as an Up & Coming Lawyer in 2016. Josh attended the University of Missouri for his undergraduate and legal education. He has lived in mid-Missouri since 2003 and has developed strong ties throughout the central part of the state. Josh joined the firm during his last semester of law school in 2010. Josh is active with the Cole County Bar Association and currently serves as the president. Josh lives near Jefferson City, Missouri with his wife, Rachel, their sons, Walter and Augustus and their dog, Ari.